Make sure to enter the ClubCouture Giveaway! I'd say your chances of winning are pretty high right now! Now these puppies were a little bit out of my price range, but they were so beautiful, I couldn't get there glimmering awesomeness out of my mind. Here's the tutorial on how to make these for less than twenty dollars, enjoy! 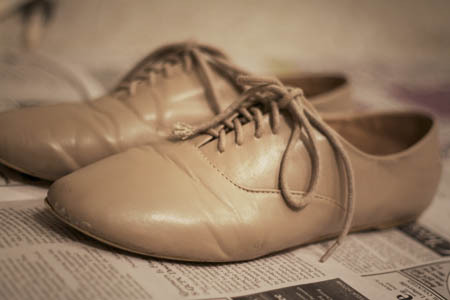 An old or new pair of oxfords, I used an old pair. 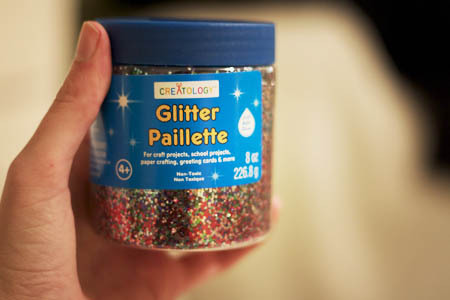 Glitter, of your color choice! 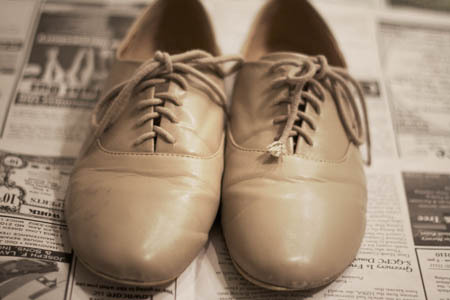 Here are the Oxford's I used, which were bought from Urban Outfitter's last year for ten dollars. These were the perfect pair to use because I was tired of my boyfriend calling them my "granny" shoes. Apparently his grandmother has these too? Definitely need glitterified! 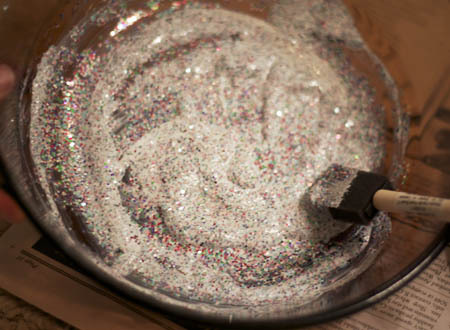 Then you are going to pour the glue and glitter into a designated bowl. I recommend a lot of glitter for this. Probably more than you would think necessary. 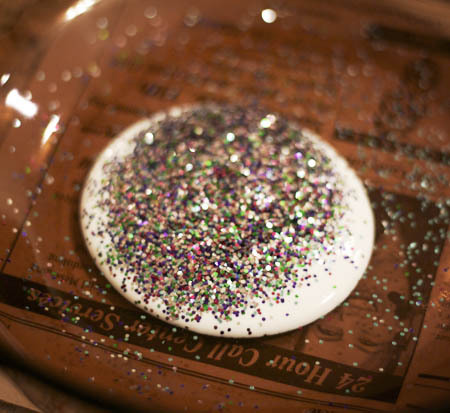 After finding the right mixture you are going to paint on an even coat of the glitter glue. Make sure to take out the laces! Note: If you want to use painter's tape for the soles and inside of the shoe you should do so before starting any gluing on the shoe. 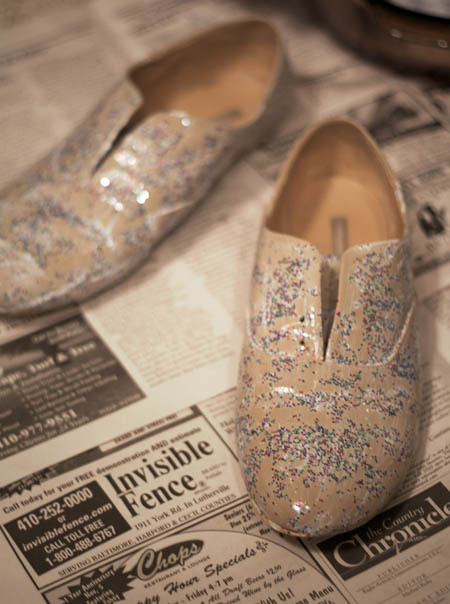 Now, for the second coat I poured glitter from the bottle onto the shoe and then pushed it in with the leftover glitter glue from before. 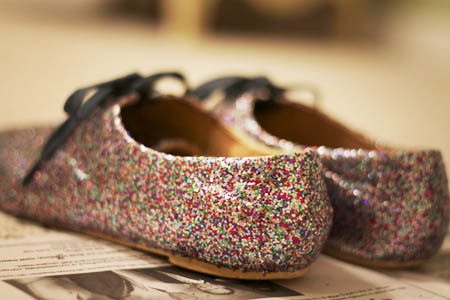 You want to try and make pretty even coats, which you do by smoothing out the glitter with long strokes of the brush across the shoe. Below is what my shoe looked like after two coats. I ended up doing another coat at the end just to ensure it was full sparkles. After that I took glue and, using my other sponge brush, put on two layers without any sparkles mixed in. This step is to ensure none of the sparkles fall off. After the layers of glue dried I took my shoe outside and sprayed it with waterproof shoe protecter. If you don't do this, they will most likely be ruined from any contact with water. We had some lying around the house, but I'm pretty sure it's not that expensive. Next you will be needing your toothpicks to poke through the preexisting holes for laces. 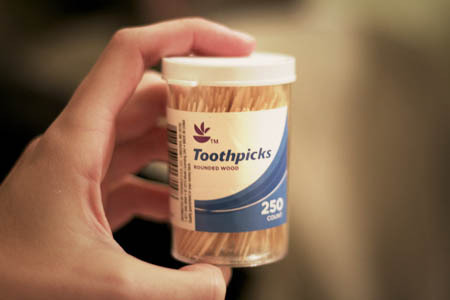 If you don't have toothpicks lying around you can also use the tips of laces themselves. Once your holes are made, lace em up! I had an extra pair of blue laces from my Keds, so I ended up using those. The tan ones were a bit ruined. Let me know what you guys think! Do you like the shoes, if so are you going to make a pair? If you do make sure to send me pictures, that would be awesome. Do you like DIY post on Wild Flower, would you like more? Let me know darlings! i LOVE these. :) i can't wait to try this for myself. They're super cute! Have fun with your adorable shoes! WOW!! Those are amazing!They look sooooo good Im totally trying that! Those look fantastic! 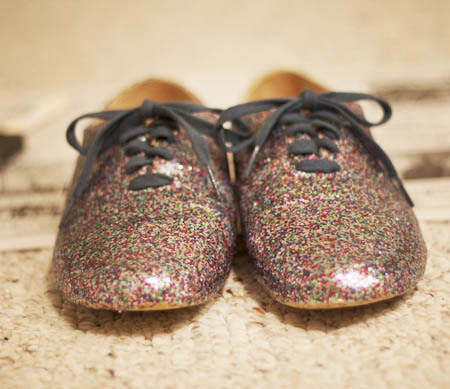 I really want a pair of sparkly oxfords! 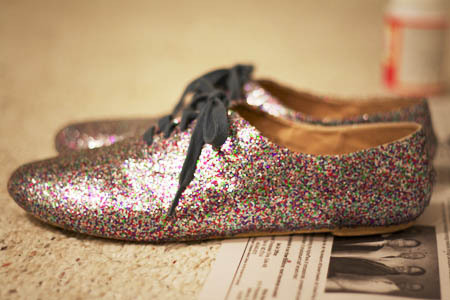 I have sparkly heels, but these could be worn for regular days haha. You did a great job. They look so good! I don't have any extra pairs of Oxfords laying around right now, but if I find some on sale I would definitely like to try these. Going to pin this idea just in case! so cute! im so going to try this! Wow, this is such a good idea! I love them! 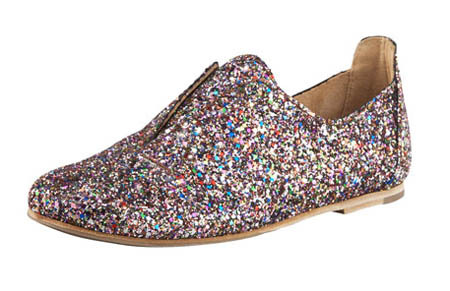 Does the glitter fall off though when you walk? I would love to see more DIY projects! These are so amazing! 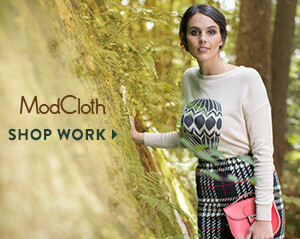 I want to try this outfit! It is such a cheaper alternative then the real ones... that is a ridiculous price. I love your blog btw, its so fun. 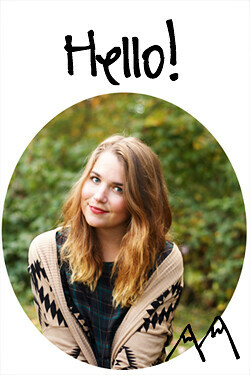 I really like your blog and everything you've posted!! Super snazzy shoes. I don't DIY things a lot so I might try these, they're that kool. woh!! These turned out so well!!! I might actually try this if i get my hands on a cheap pair of oxfords :) lovely girl! 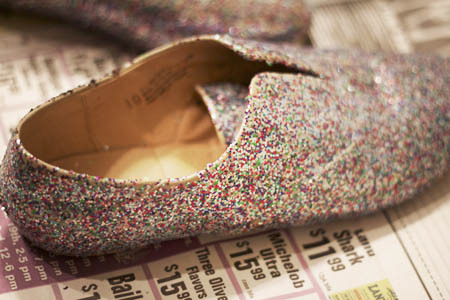 There's nothing I love more than glitter shoes and I am definitely going to use this tutorial. DO MORE!!! Love this idea. I need to get some glitter and some old shoes to put that glitter on soon! I'm totally going to make some of there this summer! These look fantastic, Miss! I'm curious if the glitter comes off in time and how easy of a fix it it? Thank you for the idea and tutorial! lovely diy and the colour chosen is great!!! omg!!! love love love this idea!! !